We are getting wax seals made and we need your help! We don't have the funds to get every state so we are starting with 10. What other three states should we start with? For your help, anyone who answers will be entered in a giveaway to win any of the new wax seals. Comment what other three states we should start with. 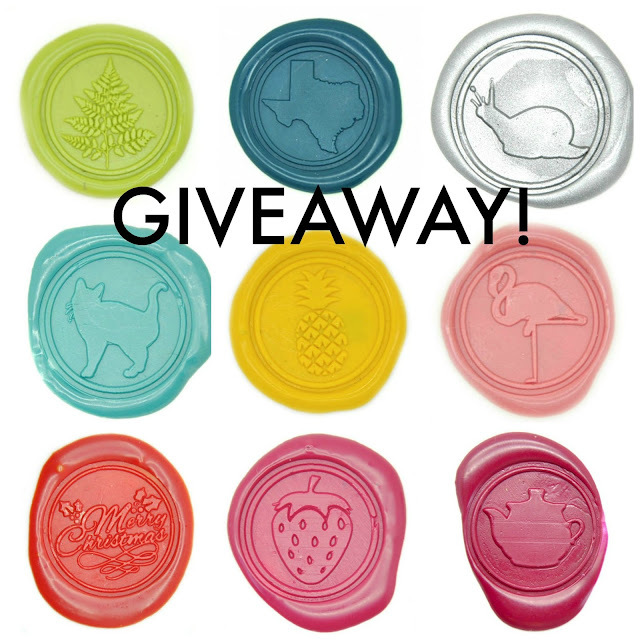 For an extra entry, share this giveaway on your blog, pinterest, twitter, instagram, or Facebook. Come back and leave a comment with a link to your post. Open worldwide, giveaway closes Friday August 14th. Hi Britney Haberl you are our winner! As soon as the seals come in, you can pick which one you want. Thanks to everyone who answered! The seals will be here soon. Wow, those look really good! My suggestions: New York, Florida, and Washington. I am already thinking of some ways to use this. New York, Florida and Arizona are my suggestions. Oh, and ditto New York and Washington. Wow, what a cool giveaway. My three votes would be: New York, Florida and Massachusetts. (Reasons: FL and NY are both in an internet list of top 10 popular states, and MA had the first post office, according to Google). Hi Britney, you are our winner! As soon as the seals come in, you can pick which one you want. Massachusetts, Michigan, Oklahoma-- good shapes. Virginia, Michigan & New York! Hi there! I suggest New York, Alaska, Florida, North Carolina. I also love letters and animals, your flamingo is great (I’d add deer, for example). My votes are New York, Washington, and Illinois! These three states that I'd like to visit - Maine, New York, and Florida! Florida, New York, and California! So much to see, so much to do! New York, Virginia and Louisiana. Thanks for the opportunity. I realize the giveaway has closed, but I'm going to vote New York, Louisiana, and Pennsylvania.